Scalable. Secure. Sustainable. Simple. Futureproof your workplace with RICOH Intelligent Devices. Learn more. See where we are located. Device Manager NX Pro makes it easy to manage and maintain a fleet of up to 5000 document output devices, including multi-site deployments. Using the powerful administration tools included in Device Manager NX Pro, IT staff can centrally manage a large enterprise fleet, including third party and USB-connected devices in addition to Ricoh models. A simple user-interface makes it easy to control the performance, functionality and access features of individual and groups of devices. Configuration settings can be quickly cloned across the fleet, ensuring consistency and freeing up administrative resources. Automated reporting and billing tools provide detailed insights into device usage and performance, enabling accurate charging within the organisation and a better understanding of how equipment is being used. Monitoring of device power consumption supports a more sustainable approach to device management. Our @Remote technology allows you to easily optimise the performance and environmental footprint of your fleet by collecting detailed device data and turning it into actionable intelligence. 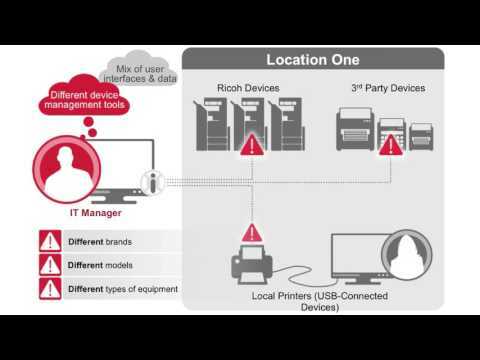 Easily manage and maintain a fleet of up to 5000 document output devices, including multi-site deployments of third party and USB-connected devices alongside Ricoh models. Enable your IT teams to efficiently coordinate the management of an unlimited number of document output devices across international operations.